Brissett finished the game, as he has done every week since replacing Tolzien as the starter in Week 2. Jacoby Brissett followed his weekly routine on Sunday. The Indianapolis Colts quarterback kept picking himself up off the turf and lining up behind center. Perhaps he should have sat out this one. After being cleared through the National Football League's concussion protocol late in the third quarter of a 17-20 loss to Pittsburgh, Brissett didn't take postgame questions because he was still being evaluated for a head injury by team doctors. "Scotty (Tolzien) started warming up as soon as Jacoby came out, because we could have lost him for the entire game," coach Chuck Pagano said, explaining one of Sunday's odder scenes. "So he went through the protocol and passed it and got back out there in time to run that series." Team officials said Brissett was initially evaluated for a concussion on the sideline twice — once with team doctors and once by the unaffiliated neurological consultant. He passed both times. Then, after the game, he developed concussion-like symptoms again and returned to the protocol. The second-year QB has repeatedly told reporters he believes he owes it to his teammates to continue playing, regardless of the situation, even though his toughness has never been questioned. Brissett wound up 14 of 24 for 222 yards with two touchdown passes and one interception despite getting sacked three more times and taking a multitude of hits from the Steelers. The problem has been his late-game performances, which have included four interceptions in the fourth quarter or overtime this season. And the biggest mistake he made on Sunday came on the first pass he threw after being allowed to return. "It doesn't fall on one guy," Pagano said. "We've got to play better, we've got to coach better. It's on all of us." 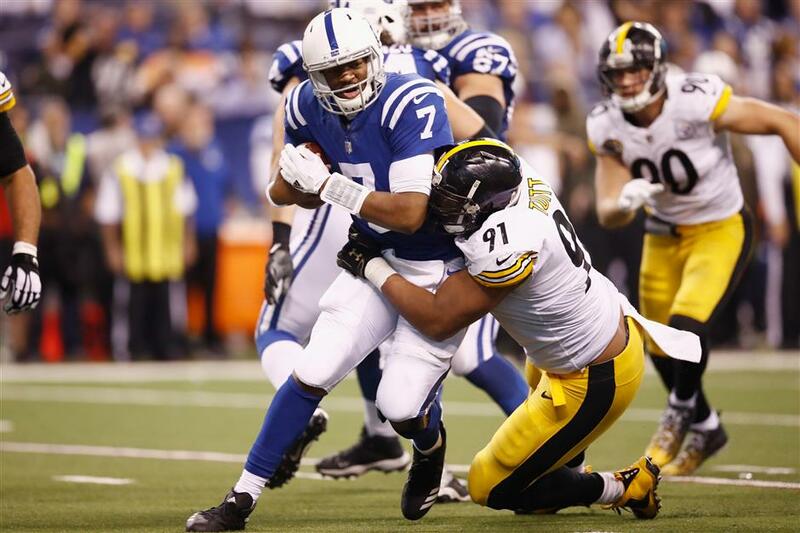 Pittsburgh Steelers defensive end Stephon Tuitt sacks Indianapolis Colts quarterback Jacoby Brissett during the second half of their NFL game at Lucas Oil Stadium in Indianapolis, Indiana, on November 12, 2017. Brissett appeared to get hurt when he took a shot to the head from Steelers defensive end Stephon Tuitt on a 3-yard run with the Colts leading 17-9 late in the third quarter. Brissett stayed down briefly, and then got up and jogged to the sideline where he was tested for a head injury. A few minutes later, following a Steelers punt, Tolzien ran onto the field and into the huddle. Before play resumed, Brissett grabbed his helmet and ran onto the field, forcing Tolzien to sprint to the sideline. "The docs did a great job and he went through the proper procedures, through the protocol, and he got back out there," Pagano said. But Brissett continued to be ineffective. His first pass went through the hands of Jack Doyle and was picked off by Ryan Shazier at the Colts' 10-yard line. Three plays later, Ben Roethlisberger found Vance McDonald wide open in the end zone for a 7-yard score, and then Roethlisberger hooked up with Martavis Bryant for a 2-point conversion that tied the game at 17 with 11:52 to play. Brissett managed just one more first down the rest of the way as Roethlisberger twice drove the Steelers into field-goal position, finally setting up Chris Boswell for the decisive 33-yarder as time expired. Now the Colts could be in store for a weeklong debate about Brissett's injury.